We know the area, and have found the most popular places to unwind and have a good time. Point Pleasant Beach, New Jersey, is a great vacation spot with plenty of tourist attractions. At The Amethyst Beach Motel, we provide our guests with exquisite rooms, as well as information about nightlife, restaurants, and activities around town. When you stay with us, you are sure to have a great time. The Amethyst Beach Motel is within walking distance to Jenkinsons, Uncle Vinnies Club, Jenks Club, Martels Tiki Bar, and so many more attractions. Visit Uncle Vinny's Comedy Club, shopping, and restaurants are all walking distance from the hotel. Quench your thirst with a tropical drink from Martell's Tiki Bar™. This world-famous bar has a dance floor and some of the best bartenders around. Jenks Club™ is a premier nightclub that is the best place to dance the night away. They host talented, live bands and popular DJs. Escape the heat and experience the wonders of the ocean. Jenkinson's Aquarium™ has a wide variety of fish and sea life, including seals, sea horses, and penguins. Every Tuesday and Friday is wristband day at Jenkinson's Boardwalk™. 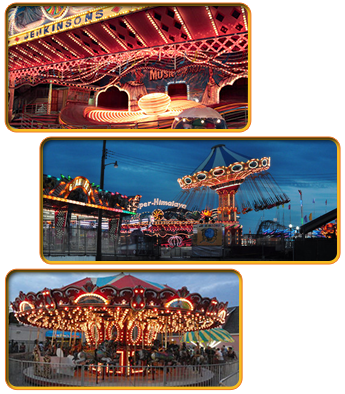 For $18.00 per person, you are able to ride all the rides. Visit their site for more information about times.